I combined my love for french toast and pancakes to make porntastic french toast pancakes! Layered them with elli quark sea salt caramel quark and a drizzle of chocolate. Voila! perfection! This ginormous stack of foodporn technically makes 4 servings so be sure to share with a friend. or eat them all. i won't judge. Heat your skillet while you prepare your pancakes. In one bowl, combine pancake mix with 2/3 cup muscle egg whites and 2/3 cup water. In another bowl, combine pancake mix with regular egg whites and 2/3 cup water. Let both bowls sit a few minutes to allow the mixtures to thicken. Cook up pancakes like you normally would and set aside to cool. Dunk the pancakes in the muscle egg egg whites and cook up like french toast. 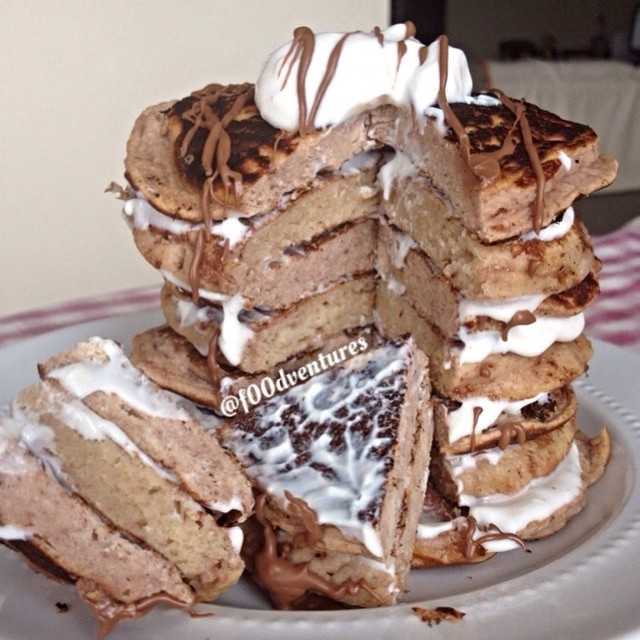 Stack pancakes, layer with sea salt caramel quark, and drizzle with melted chocolate. enjoy.